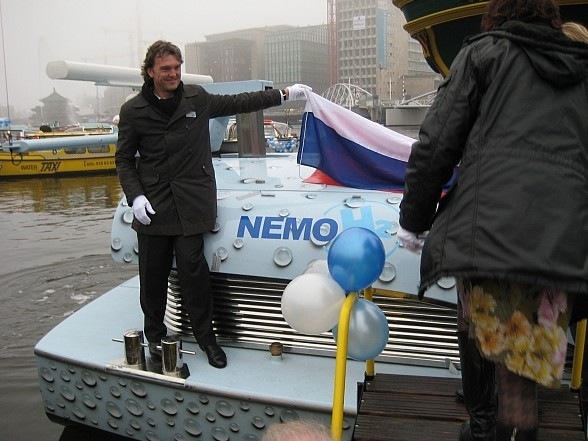 World’s first fuel cell powered canal boat “Nemo H2” was launched in Amsterdam on December 09. Innovative, durable, carbon neutral, zero-emission canal boat. No combustion: The ship is propelled by electricity generated by the fuel cell by mixing hydrogen and oxygen. Alewijnse Marine Systems – Electronic systems in ships. Linde Gas Benelux – Production, storage and distribution of hydrogen. Marine Service Noord – mechanical engineering in ships. Integral – Coordination, project management and external relations. Passengers: 86 passengers + 2 crew members. Dimensions: Length – 21.95 metre; Width – 4.25 metre. Propulsion: 1 electrically powered stern thruster and 1 electrically powered bow thruster. Power system: Two 30 kW PEM fuel cells with 70 kWh battery. Hydrogen storage: 24 kg in 6 cylinders stored at 35 MPa. Endurance: Averaged 7 knots during 9 hour. Owned by Boat Company Lovers – one of the largest canal cruise companies in Amsterdam. The canal boat meets all European regulation for barges. The boat is expected to be commissioned in spring of 2010. Here is one more photograph of Nemo H2 from Rederij Lovers. View more photographs of Nemo H2 here. For more details on Nemo H2, log on to Fuel Cell Boat. Read more from Lovers, full press release as pdf.